In the past, there was a tradition in the U.S. military to paint pin-ups on aircrafts. Today, that tradition lives on in Japan. But there’s an important difference: they’re not cheesecake pin-ups. They’re anime girls, and they’re not only on aircrafts, but also recruitment posters. During the annual festival at the Japanese Self Defense Force’s Kisarazu base, visitors can check out the aircraft and vehicles. Blogs like Aki Setsura and Airborne were on hand to snap photos. One Cobra chopper from the 4th Anti Tank Helicopter Unit was covered with “Kisarazu Akane” (above). The 1st lieutenant is an “image character” for a unit on the base—an anime girl mascot, if you will, with missiles. Over the years, there have been other image characters. On 2ch, the reaction to this has varied, with some wondering if it’s okay to entrust these folks with Japan’s defense. Others pointed out that these anime girls are similar to the aircraft pin-ups of yore in that they’re not entirely serious. In recent years, however, that sort of saucy nose art has been deemed offensive in the West. That doesn’t seem to be much of a concern in Japan: At the Kisarazu event, there was an Akane cosplayer on hand and even a sheet that listed the character’s vital statistics. Her bust-waist-hip measurements were listed as a “national secret”. 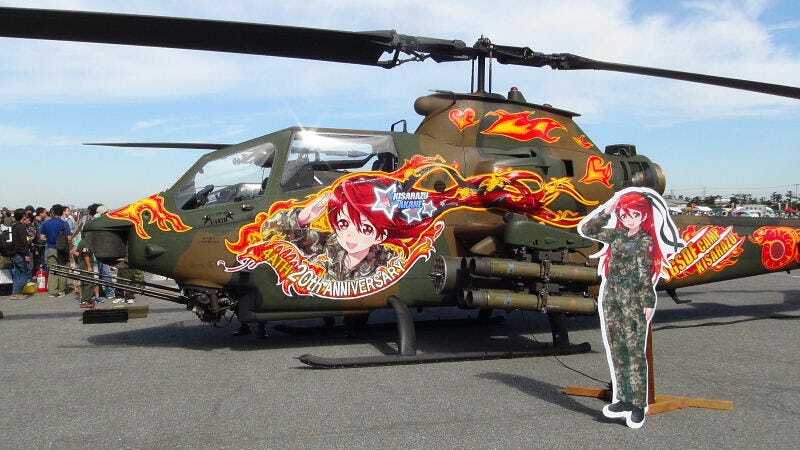 This anime girl-style painting on a military vehicles is a thing, but it doesn’t seem to be widespread in Japan yet—nothing like the pin-ups on American aircraft during WWII were. Anime girls, however, are used in official recruitment posters for the Japanese military. If people in Japan are willing to cover expensive sports cars like Lancias and Ferraris in anime characters, then why not military aircrafts? And why not use anime characters for recruitment? Just more examples of just how widespread the country’s geek culture is. This article was originally published on October 15, 2012. It has since been updated and expanded.